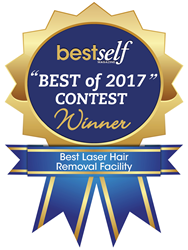 Dr. David Whiteman and the entire team of Laser Lights Cosmetic Laser Center and Southern Plastic Surgery are honored to be named the Best Laser Hair Removal Facility in Atlanta for both 2016 and 2017. We’re always honored to win an award, but it’s especially exciting when our own patients were the ones who nominated and voted for us. For the second year in a row, Laser Lights Cosmetic Laser Center has earned the award of Atlanta’s Best Laser Hair Removal Facility. This distinction comes from Best Self magazine’s “Best of 2017” reader poll. Every year, Best Self hosts a “Best of Atlanta” contest. They accept nominations for top providers in over 180 health-related categories from thousands of people. With the nominees collected from the public, Best Self opens the contest for voting. The magazine’s readers as well as residents from every area of metro Atlanta vote for the providers who have helped them on their health and wellness journey. Through this process, Laser Lights Cosmetic Laser Center is proud to find that their patients were so satisfied as to vote them Atlanta’s Best Laser Hair Removal Facility for the second consecutive year. For Laser Lights Cosmetic Laser Center’s patients, the award comes as no surprise. On top of their exceptional laser hair removal results, the staff has also achieved great success for patients using nonsurgical fat removal, microneedling, nonsurgical skin tightening, laser skin resurfacing, laser tattoo removal, and dozens more. Serving the Atlanta community for nearly twenty-five years at Southern Plastic Surgery, double board-certified plastic surgeon Dr. David Whiteman specializes in performing cosmetic and reconstructive procedures, and he expanded his reach by becoming the full owner of Laser Lights Cosmetic Laser Center in 2016. Today, Southern Plastic Surgery and Laser Lights Cosmetic Laser Center function as one practice with two locations, one for surgery and one for nonsurgical treatments, both with the same goal - helping patients find their confidence. Laser Lights Cosmetic Laser Center is dedicated to raising the self-confidence of its patients through various laser skin treatments, non-surgical cosmetic procedures, and facial treatments, and has been for over 15 years. In 2016, double board-certified plastic surgeon David M. Whiteman, MD, FRCS(c) took over as full owner of Laser Lights to offer patients a more focused customer experience. With multiple unique lasers for every skin type, a wide variety of non-laser skin treatments, and some of the most advanced aesthetic technology available for non-surgical fat reduction, skin tightening, and more, Laser Lights can match each patient with the ideal procedures to meet their needs. Their list of services includes, but is not limited to laser treatments to remove hair, tattoos, blemishes, veins and wrinkles, as well as non-laser treatments for the face and body and medical grade skin care products. Gift certificates are also available, allowing your loved ones to select the perfect treatments for them. Laser Lights Cosmetic Laser Center’s goal is to help every patient look and feel their very best, all with a five-star experience. When you step into their offices, you join the family where they strive to foster a personal relationship with each patient to help them achieve their aesthetic goals and be the best they can be from the inside out. Patients considering non-surgical cosmetic treatments can find more information about Laser Lights Cosmetic Laser Center at http://www.atlaserlights.com. Patients who are considering plastic surgery can learn more about Dr. David Whiteman and the rest of the Southern Plastic Surgery team at southernplasticsurgery.com.